Black baseball cap featuring an eagle shield on left front panel. Right front panel embroidered in red “Germany”. German flag also embroidered on right panel above ear. 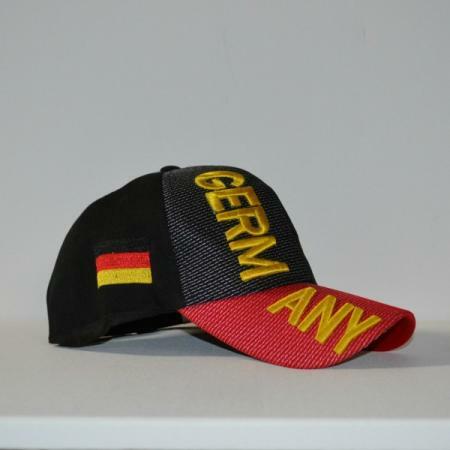 Back closure embroidered “Deutschland” in red with Velcro closure. Black baseball cap featuring an eagle shield on left front panel. Right front panel embroidered “Germany” in red. German flag also embroidered on right panel above ear. Back closure embroidered “Deutschland” in red with Velcro closure. Circular, reflective Innsbruck Shield Goldenes Dachl decal. Measures 2 1/2 from left to right and 2 15/16″ from top to bottom. Imported from Germany. Self sticking Deutschland decal. Measures 4 3/4″ from left to right and 3 1/4″ from top to bottom. Features flag, crest and gold trim.